SCOTTSDALE, ARIZ.—CIRQ+, a disruptive IoT technology, took top honors as Best New Hotel Product and Best of Show during the 2018 Editor’s Choice Awards at the Hotel Experience (HX) at the Javits Convention Center in New York City. The event was held from November 11 to 12. The judges were editors of the leading hospitality trade magazines. All HX exhibitors were invited to enter a new product—introduced to the market since November 2017. 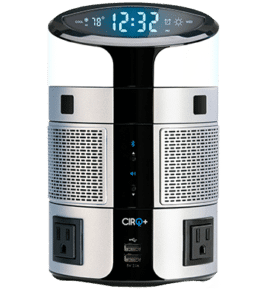 CIRQ+ is a patented, cloud-based platform that instantly modernizes any hotel room by transforming it into a Smart Room for Smart Guests. The state-of-the-art Energy Management System (EMS), combined with a modular and future-proofed in-room hub, bridges the gap between guest comfort and engagement while reducing property operating costs. The system consolidates numerous in-room products into a unified solution—from EMS, power outlets, charging, alarm clock, Bluetooth speaker, to thermostat controls and more. Guests can control their in-room settings from an app on their mobile device or from the CIRQ+ in-room hub, giving them comfort, convenience and connectivity at their fingertips. Additionally, guests can migrate their personal preferences from CIRQ+ enabled properties to maximize their experience, build loyalty and add value. HX is a high visibility, hospitality focused conference that is attended by more than 7,000 hotel owners, GMs and operators from around the world. “It’s an honor to be recognized by industry leaders and experts who understand how our CIRQ+ platform can be a disruptive solution for hotels allowing them to instantly modernize their rooms and reduce energy consumption with a unified system,” said Yani Deros, Founder and CEO of CIRQ+. In addition to the prestigious award, CIRQ+ was one of five finalists for the annual HX TECHPitch. Deros also engaged with other Forward Thinking Leaders during the Fireside Chat on Emerging Trends.